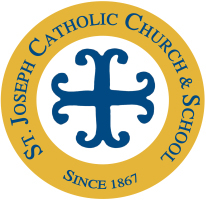 09/25/18 Welcoming, What is RCIA?, St. Joseph Catholic Church history and tour. 10/02/18 Mental Images of God. How God Invites Us to Grow. 10/30/18 Mary and the Saints: Our Spiritual Mother and the Communion of the Saints. 11/13/18 The Last Things: What Happens After We Die? 11/20/18 No Session ~ Happy Thanksgiving!! 11/27/18 The Lectionary, Liturgical Year, What is Advent? 12/23/18 No Session ~ Merry Christmas!! 12/30/18 No Session ~ Happy New Year!! 03/03/19 Paschal Mystery | What is Lent? 03/06/19 ASH WEDNESDAY MASS @ 8:15 a.m. and 5:00 p.m.
04/21/19 Easter Sunday ~ No Session ~ Happy Easter!